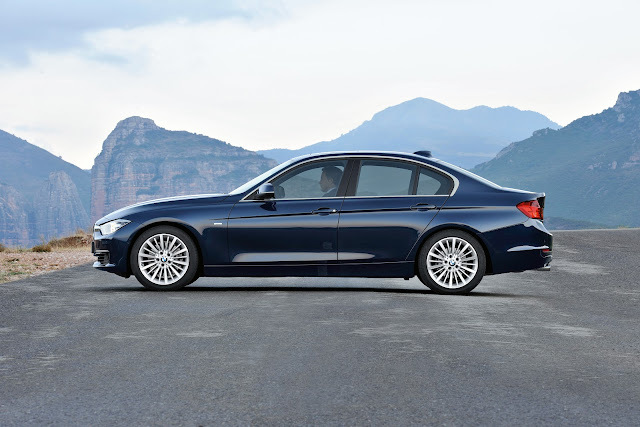 BMW has launched its sixth-generation 3 Series in India. And if that wasn’t great enough news, here’s some more. The German carmaker has roped in Sachin Tendulkar as the brand ambassador for the BMW cars in India. Not that the 3 Series or any other Beemer needed some marketing push, but getting the master blaster associated with a car brand does attract a lot of attention. Coming back to the new BMW 3 Series,The new BMW face, with elongated headlights reaching along as far as the BMW kidney grille, emphasizes the new BMW 3 Series’ sense of width and strengthens its athletic overall profile. The sixth generation of the 3 Series has grown moderately in size compared to its predecessor, with its wide track (front + 37 mm/1.46 in., rear + 47 mm/1.85 in.) particularly prominent, and the car’s length (+ 93 mm/3.66 in.) and wheelbase (+ 50 mm/1.96 in.) also accentuates its sporting allure. Inside the new BMW 3 Series Sedan, the rear passengers will appreciate the noticeable increase in space made possible by the larger dimensions. And the BMW 3 Series range is now also available in a trio of trim and equipment variants – the Sport Line, Luxury Line and Modern Line. Each presents its own individual take on the character of the sports sedan, with exclusive, high-quality material combinations and unbeatable build quality underlining the premium ambience of the new range. Drive and chassis technology have always been key areas of expertise for the brand, and agility and driving dynamics remain outstanding attributes of the new BMW 3 Series . The car will be offered in four trims a base model (only available in diesel), sport line, luxury line and luxury plus. There will be two engines on offer, a 245bhp 2.0-litre petrol and 184bhp 2.0-litre diesel. The car is equipped with a host of techno-wizardry like the heads up display, 8.8-inch multi media screen and an integrated navigation system. The new 3 Series is the first model to feature BMW’s new design language. If you want to choose performance then the 328i is the car to get. It does a 0-100kph in just 6.1 seconds and an electronically restricted top speed of 250kph. The diesel is no sloth either, what it lacks in power the 320d makes up in torque, 380Nm to be precise. The 0-100kph is little more than a second slower at 7.6 seconds and a top speed is restricted to 235kph. The interplay of surfaces and lines fills the interior with life. The interior of the new BMW 3 Series Sedan is straight out of the BMW design handbook. The driver-focused cockpit wraps around the driver and puts all the important controls within easy reach. The cockpit is angled towards the driver by seven degrees. The ingenious layout of the front cabin incorporates the driver-focused cockpit as part of its natural design – i.e. without excluding the front passenger. The surfaces and lines flow over the instrument panel towards the front passenger side of the cabin, where they form a smooth, protective border. In the driver’s area all the lines converge on a single point behind the steering wheel and guide the eye towards the road. The cockpit’s four circular dials (fuel gauge, speedometer, tachometer and oil temperature gauge) come with a black panel display. Positioned on the horizontally-structured instrument panel, the freestanding iDrive monitor with slim, transreflective, high-resolution display recalls the latest flatscreen televisions normally found in living rooms rather than cars. On the driver’s side of the deliberately asymmetric center tunnel, a different trim surface and graining mark out the active driving elements of the interior, while the trim surface on the front passenger side exudes a pleasingly elegant air. Positioned centrally on the center console within easy reach of both the driver and the front passenger is the standard iDrive Controller. More space, wide variety of storage compartments, even greater practicality. Passengers in the rear of the new BMW 3 Series Sedan will enjoy significantly more space than in the outgoing model. The car’s larger dimensions ensure rear passengers are welcomed by 0.71 in. /18 mm of extra legroom inside the doors as they climb aboard. Behind the fully contoured front seats, 0.6 in / 15 mm of additional knee room and 0.31in. / 8 mm of extra headroom further enhance the passengers’ comfort on the road. Backrest nets offer additional accommodation for small items, reflective vests and road maps. Larger pockets in the front doors, whose lines and surfaces open up towards the instrument panel, now have space for drink bottles up to one liter in size. Added to which, two large drink holders are now integrated into the center console ahead of the gearshift lever. If desired, the cupholders can be swapped for an oddments tray, which is stored in a special area of the glove compartment when not in use. The new sedan offers 480 liters of luggage capacity, 20 liters more than the outgoing model in DIN measurement protocol. And an innovative and practical solution allows extremely convenient access inside. If the optional Comfort Access is specified, the trunk can be opened hands-free and without needing to use a key. For example, if the driver approaches his new 3 Series with both hands full, all he/she needs to do is move his/her foot around underneath the bumper to trigger the opening mechanism for the trunk lid (see also BMW ConnectedDrive). The luggage compartment can hold as much as three golfbags, or a pram and chassis inserted over a remarkably low trunk sill that is a mere 26 inches high (66 cm). Standard securing hooks hold the items firmly in place, while a storage tray under the load compartment floor and a deep storage compartment on the left-hand side accommodate small oddments. For bulky items, the optional Through-Load includes a folding rear seat bench to allow flexible transport solutions. The 40:20:40 split rear backrests offer unbeatable versatility when you need to carry passengers and long items, such as several pairs of skis or snowboards, at the same time. sporty handling, high agility and increased comfort. 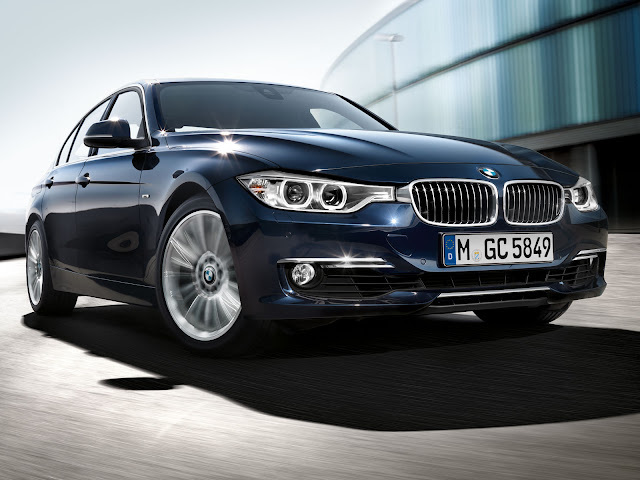 In the sixth model generation, too, dynamism and performance are among the stand-out features of the BMW sports sedan. These qualities are underpinned by a precision-engineered chassis with four-wheel independent suspension that perfectly complements a winning formula: a longitudinally mounted engine, rear-wheel drive, balanced weight distribution and torsionally stiff body. In the new BMW 3 Series the engineers have further improved the already outstanding handling qualities of the predecessor and its excellent agility and directional stability, while at the same time noticeably improving comfort. To achieve this, they have made extensive use of extra-lightweight chassis components, sophisticated and perfectly tailored axle kinematics and a high-precision steering system. State-of-the-art electronic control systems on the new BMW 3 Series Sedan help manage the vehicle dynamics and ensure that the combination of outstanding sporty performance and increased comfort can be enjoyed to the full and with complete peace of mind. With friction-reduced wheel bearings and ball joints, aerodynamic improvements at the rear axle and reduced rolling-resistance tires, the whole chassis plays its part in reducing fuel consumption and thus emissions. A wheelbase of 110.6 inches / 2,810 mm (+ 1.96in/50 mm) and a front and rear track width of 60.3 / 1,543 (+ 1.46 in / 37 mm) and 61.9 / 1,583 millimeters (+ 1.85 in/ 48 mm) respectively give the new BMW 3 Series Sedan a more road-hugging stance than its predecessor, while the weight-optimized powertrain and lightweight body design result in a perfectly balanced 50:50 weight distribution. Body and safety: The safest BMW 3 Series yet. The new BMW 3 Series offers its passengers exceptional active and passive safety. Judicious selection of materials, a high-strength structure and an intelligent lightweight design concept allow the body to meet the most exacting standards, and it teams up with highly efficient restraint systems to provide maximum occupant protection. At the same time, the lightweight construction of the new BMW 3 Series makes a significant contribution to the efficiency and agility of the new sports sedan. In addition, an extensive package of active safety components help the driver to avoid accidents or, if a collision is unavoidable, to minimize its consequences. The same goes for the optimized pedestrian protection systems. All in all, the flawlessly assembled overall concept of the new BMW 3 Series makes it an incredibly impressive proposition – not least in terms of safety. Individual protection at every seat. The exemplary crash responses of the new BMW 3 Series Sedan body also provide the best possible basis for the optimum design and set-up of the car’s restraint systems. The sports sedan is equipped as standard with front and side airbags for the driver and front passenger, plus head airbags for both rows of seats. Responding to the nature and severity of the impact, the integrated safety electronics ensure that only those airbags that are able to provide effective protection are deployed at the optimum time. Those airbags that are not required remain unused – and therefore ready to spring into action should there be a second collision. All seats are fitted with three-point inertia-reel seat belts, and the driver and front passenger also have belt latch tensioners and belt force limiters. Also part of standard specification are ISOFIX child seat attachment points for the rear seats.